Looking to stock up on some of the items your family uses the most? 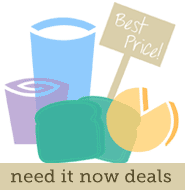 Check out this week’s Need it Now deals! Leave a comment if you find any other awesome deals. Food City – Jumbo Cantaloupe $2.50 ea. Food City – English Cucumbers $1 ea. Food Lion – Hot House Cucumbers, seedless, 99¢ ea. Food Lion – Hass Avocados, 99¢ ea. Aldi – Cantaloupe 99¢ ea. Aldi – Pineapple 99¢ ea. Harvey’s – Large Cantaloupes $1.67 ea. Bi-Lo – LaRouge Red Peppers 99¢ ea. HEB – Russet Potatoes 5 lbs, 98¢ ea. HEB – Ataulfo Mangos, 33¢ ea. HEB – Small Red Delicious Apples, 33¢ ea. HEB – Strawberries 1 lb, $1.88 ea. HEB – Small Pears, 33¢ ea. Save 10¢ per gallon WYB (4) participating items. HEB – Aspen Super Strong 9″ Paper Plates 120 ct.